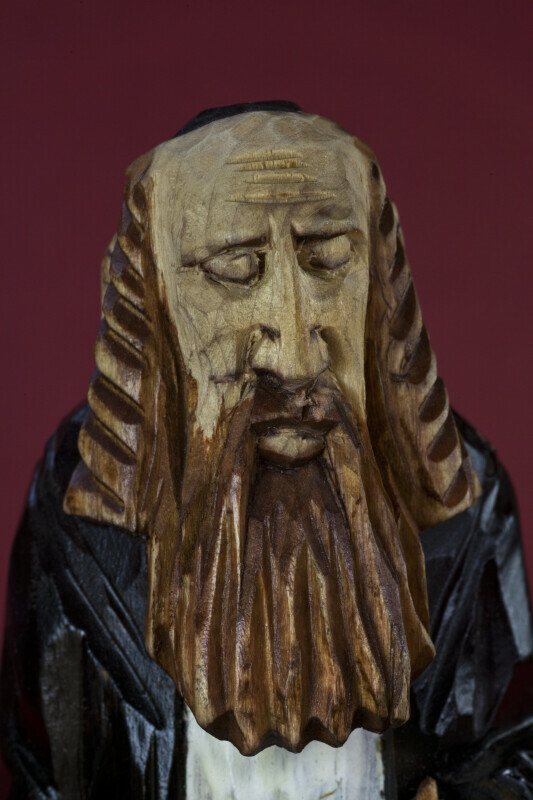 Hand made and painted wood carving a rabbi holding a shofar. He is wearing a long black coat, and has a long beard and payots (long sideburns or curls). The rabbi is wearing a yarmulke (small skull cap) on his head. It symbolizes piety and reminds Jews that the Divine Presence is over his head. Rabbis also wear a tzitzit, with tassels that hang down from a garment. A shofar is a musical instrument, usually made of a ram's horn. The shofar is blown as a part of services in the synagogue on Rosh Hashanah and Yom Kippur. The figure is 6 inches (15 cm) tall.